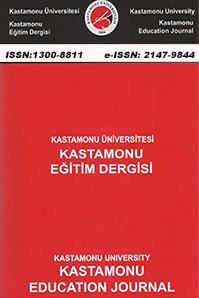 Kastamonu Education Journal(Kastamonu Eğitim Dergisi), published by Kastamonu University, Faculty of Education, is an international peer-reviewed journal. Being a non-profit and public organization working for the good of the public and as part of its foundation purposes and social responsibility policies, Kastamonu University, Faculty of Education, attaches importance to improving the education system. Kastamonu Education Journal is and will be happy to contribute to qualified scientific studies which bear the potential to solve educational problems. In this journal, the articles in the base field of Educational Sciences and Teacher Training and translations with high scientific quality, scientific observations are published.